NEW YORK -- Federal prosecutors on Thursday revealed charges that accuse a Tunisian man who had lived in Canada with applying for a visa "to remain in the United States to facilitate an act of terrorism." The charges name Ahmed Abassi, a native of Tunisia who had been living in Canada. Prosecutors say he came to New York in mid-March. Federal investigators say he met with the men involved in a plot -- first revealed in mid-April -- to attack an Amtrak passenger train from New York to Toronto. They say the plotters discussed blowing up a bridge at Niagara Falls to cause the train to plunge into the gorge below. Canadian authorities announced in mid-April that the plot had been stopped. They disclosed then that they had arrested two men -- Chaieb Esseghaier of Montreal, a 30-year-old Tunisian graduate student who is reported to have guerrilla warfare training and is described as the ringleader, and Raed Jaser of Toronto, 35, a school bus driver. 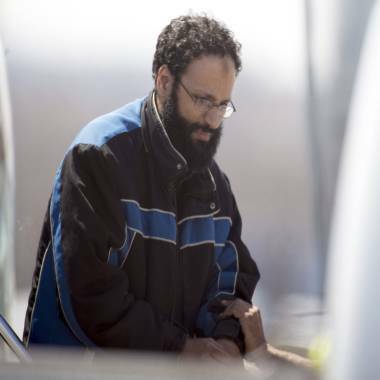 Chiheb Esseghaier, one of two suspects arrested last week in Canada in connection with the alleged terror plot to derail a passenger train near the U.S.-Canada border, arrives at Buttonville Airport outside Toronto on April 23. Federal prosecutors from the Southern District of New York said Thursday that Abassi was arrested 17 days ago. The fact that word of his arrest was withheld indicates he was likely providing some information about the plot to investigators. He is charged with fraudulently applying for a work visa "in order to remain in the United States to facilitate an act of international terrorism," according to a statement from the Justice Department. Authorities in Canada said in April that an al Qaeda facilitator in Iran had worked with Esseghaier, and also that the train they intended to target was an Amtrak train originating in New York's Penn Station. "Esseghaier was simply a bad guy, and dangerous. This guy was purely evil," said one investigator, and had scientific training and the technical ability to make chemical bombs. The FBI has covertly monitored the activities of the two Canadian men, their contact with overseas Al Qaeda facilitators and others, and their possible connection to others who could be linked to the plot. "What Mr. Abassi didn't know was that one of his associates, privy to the details of the plan, was an undercover FBI agent," said George Venizelos, the FBI Assistant Director in Charge of the New York office. The yearlong covert investigation involved electronic and physical surveillance. Authorities emphasize, however, that this was no sting operation. It was, they say, a significant terror plot, once which failed to get more notice because of the Boston Marathon bombings. Raed Jaser is seen arriving at court in the back of a police car in Toronto on April 23. Esseghaier and Jaser made their initial court appearances in Canada in April. They are charged with conspiracy to commit murder, conspiracy to interfere with transportation and participating in terrorist group activities. Esseghaier told the court that the Criminal Code of Canada “is not a holy book” and did not apply to him. Richard Esposito is senior executive producer of the NBC News investigative unit; Jonathan Dienst is WNBC chief investigative reporter and NBC News contributing correspondent in New York City; Pete Williams is NBC News justice correspondent.